Aadhaar Enrollment form which is filled. Proof of Identity documents (POI). Proof of Address document (POA). Date of Birth Document (DOB). You must take all the three original or attested photocopies of the three documents except the Aadhaar Card enrollment form which is filled. The attestation can be from any Garneted / Notary officer in the photocopies. From the following given below, which is containing with name and photo can have any one for supporting proof of Identity document (POI). 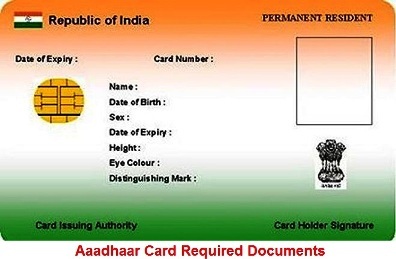 Government photo ID cards/service photo Identity card issued by PSU. ID with photo that is issued by any Recognized educational Institution. Bank ATM card with photo. Address card issued by Department of posts that is having name and photo. Certificate of Identity issued by Garneted officer or Tehsildar which is having photo on letterhead. Disability Id card/handicapped medical Certificate which is issued by the respective state/UT Governments/Administrations. Any one of the following document is needed as support for the proof of Address (POA) documents that contains name and address. Signed letter having photo issued by Recognized Educational instruction on letterhead. Certificate of address having photo issued by MP or MLA or Gazetted officer or Tehsildar on Letterhead. Caste and Domicile certificate having photo issued by state Government. Any one of the following document is needed as support for the proof of date of Birth (DOB) document. Certificate of Date of Birth issued by Group a Garneted officer on letterhead. Any one of the document given below is necessary for supporting proof of Relationship (POR) documents that has Relationship details to head of family. CGHS/State Government /ECHS/ESIC medical card. Birth, Municipal corporation and other notified local Government bodies like Taluk, Tehsil etc. Any other central/state Government issued family entitlement document. Please Keep the Above Mentioned Documents you can produce the docs in Enrollment center you can get Aadhaar Very Easily. Anyone have queries on this article please leave your doubt in the below comment form.